See the time projected on your wall or ceiling. This updated design of one of Oregon Scientific's most popular projection atomic clocks now features an indoor thermometer. Activate the projection feature by hitting the snooze button or use the included AC adapter for continuous display. The projector can be rotated 180 degrees and focused for added convenience. 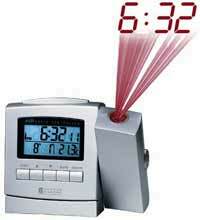 It uses the U.S Atomic Clock to set itself so you never have to set the clock again. It even adjusts for daylight saving time. The HiGlo backlit LCD displays time, day, date, indoor temperature, and low battery warning. The alarm has an 8 minute snooze. Actual size: 5.5" x 1.5" x 4.5"